The social events at the IWMW 2015 event include the conference dinner on Monday 27 July, the wine reception and optional buffet and meeting place on Tuesday 28 July and, for those arriving on Sunday, a suggested meeting place and place to eat. A meal will be provided at Edge Hill University on the opening night, Monday 27 July. Afterwards participants will be able to explore the pubs and bars in Ormskirk, which is about 10 minutes walk from the Edge Hill University campus. Links to information on suggested pubs and bars are given below. Wetherspoons is new and big and central. Styles is smaller and possibly nicer. It just over the road from Wetherspoons (and through a little walkway). Junk is a new bar in town which looks quite nice. A wine reception will be provided on the second night, Tuesday 28 July. Afterwards participants will be able to explore the restaurants, pubs and bars in Ormskirk. In addition details of a pub venue which has a large upstairs bar which will be reserved for IWMW 2015 delegates is given below. It will also be possible to have a buffet meal at this pub, but bookings must be made in advance. Although delegates are free to explore the restaurants, pubs and bars in Ormskirk in small groups, we are also reserving the upstairs bar at the Salt and Liquor pub (36 Derby Street, Ormskirk, L39 2BY) (see Facebook page and Twitter account) which is large enough to host IWMW 2015 delegates. 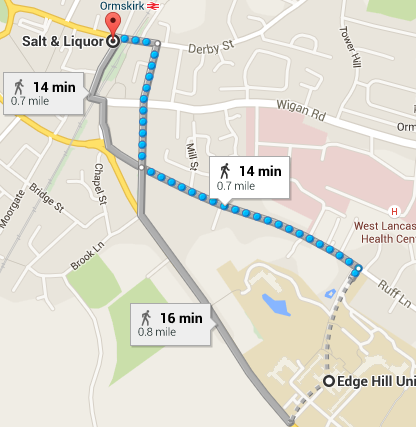 The Salt and Liquor is 15 minutes walk from the University (see Google Maps), very near Ormskirk Station. Delegates may wish to reserve a buffet meal at the Salt and Liquor. A buffet menu is available as described above. The menu is given below. 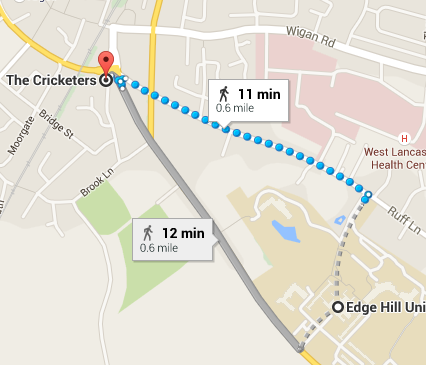 The suggested meeting place on Sunday evening is The Cricketers (24 Chapel St, Ormskirk L39 4QF). As shown on Google Maps this pub is about 10 minutes walk from the University. If you go out of the main campus entrance and walk down the gentle hill towards town, then it’s on the left hand side as you get to the traffic lights. Note that if you to go out of the back entrance and walk down Ruff Lane towards town, you will still come straight to it over on the left hand side, but it’s at the second set of lights, they just go straight on at the first set. “To accompany your meal you can choose from a fine selection of quality wines, real ales, continental lagers, craft beers, whiskies and barista coffees. The opening times for meals on Sunday is 12-8pm.